Technology is growing rapidly from day to day. Previously, we used to have only one mobile per home, but later that got changed to more than 1 per person. This change took just 2 to 3 years to happen. Now, almost everyone has a smart phone. Due, to its beautiful features and elegant look, a SmartPhone is being used by every person and it has become part of their life. Among different smart phones with different Operating Systems, Android has its importance. Apart from the default functionality provided by the smart phone, additional features can be added to mobile by installing applications. So, Smartphone will be full of apps related to a music player, media player, camera roll, reminders and more. Due to these installations, internal storage of the mobile gets reduced and makes the mobile to function slowly. The output of the recent survey states that every user of smart phones like HTC One, Samsung Galaxy S Duos, and Moto G 2nd generation is trying to have their mobile with long battery life. Even though there are apps installed on the Smartphone, this can be achieved by following some simple tips or using power saving apps on your Android device you can improve battery life. Check our best Video Editing Apps for Android. Go to Settings > Battery and the list of apps using the battery are shown in the sorted order. Find the apps which you rarely use and uninstall them. Most of the apps like Facebook, Linkedin, and Twitter keep polling and refreshing for new data and this reduced the battery life. Just for few days enable only the apps which you want and stop this polling. Then, you will find the increase in your battery life and alert on you can continue the same. If you are not using WiFi or data connection turn them OFF immediately. Searching for available networks unnecessarily kills the battery life. If radio and other players are running in the background, turn them OFF even. Go to Settings > Apps and see the list of apps running in the background. Just tap on the app and see what it is running for. If not needed, then stop them if it is not necessary to keep it running in the background. Widgets which are on the home screen also consume power. They are meant to show some information on the screen and they keep on polling for the data. If it is not necessary then dumping it away is the best solution to increase the battery life on the mobile. Same is to be done with the animated wallpaper. 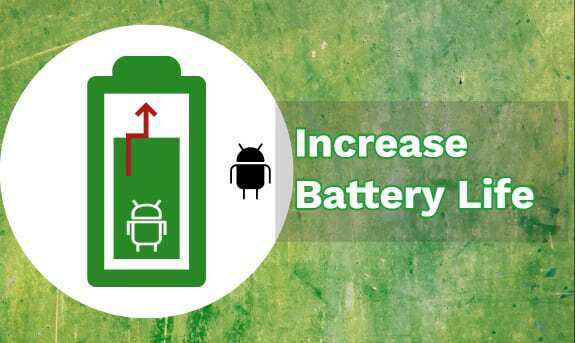 All these tips can improve your Android Mobile battery life but the problem is that we can’t follow all these tips every time so check out some of the top Android apps to reduce battery usage. Don’t forget to share your favorite app. This application comes with three types of cleaners. Apart from the Default cleaner, it has two other by name Cache cleaner and History cleaner. Cache cleaner removes all the temporary files created by your apps very easily. You can select few apps to remove temp files or you can remove temp files of all apps at once. It helps you in showing the apps in the sorted order of the cache so that you can prioritize the apps on which the operation to be performed. 1Tap Cleaner shows you the total internal storage and the available space from that, giving you an idea to free up the required space. This seems to be working well in any android mobile like Nexus 5, Samsung Galaxy S Advanced and more. 1Tap Cleaner also allows you to schedule the cleaning of cache for every 3 days to one week if you are a free user. If you make the app to premium, you can schedule cleaning the cache from one day to 3 months regularly. History Cleaner helps you to clear the entire search history of the browser or any other apps at once or based on your requirement. This deals mostly with the privacy thing when you do not want others to know what you are searching. Default Cleaner lists down all the default settings of all apps which you have set before. If you think, those settings or add-ons creating a problem to the battery, then you can reset back to the default settings. This is mainly used to set back the android mobile back to the default settings. This Android app will free up space on your smartphone with some tools and utilities. Android Assistant provides you multiple screens namely Monitor, Process Manager and Startup Manager. The monitor shows you the status of the battery, memory usage, and the CPU. You can kill or free space used by some apps with just a click on the Quick Boost button. You can even select apps which you want and can perform the action. You can kill apps manually from the list of apps shown by Process Manager which is the second screen of Android Assistant. This killing of an app does not give you any problem and helps in improving the battery life. More utilities are provided by the tools pages. Cache cleaner displays the size of the temp files created by each app and remove them to free up space. There is also a feature called Batch Uninstall which shows all apps which have not been used for few weeks. Select particular app which is not required and try to uninstall it. However, it asks for confirmation before uninstalling an application. Most important feature of this app is the Startup Manager. This would allow you to stop some apps from being loaded when you turn on your mobile. It also shows the list of apps which can be moved to SD Card. So, move those apps to SD Card and some internal storage will be free. This is the best for users like Samsung Galaxy Note 4 and HTC One X as they have more apps getting started when the mobile is turned ON. Android assistant stops them from starting up rather than killing them. This is used to manage both running and installed apps on your android mobile. Every time you open this app, this gives you the list of apps that are currently running and the space it is taking in the internal storage. It also allows killing apps in batch but requires your confirmation. Allowing apps to move from phone to SD Card and the opposite way helps to maintain the required internal storage. Even this movement of apps can also be done in a batch. Similar to the Android Assistant app, it allows you to kill and stop apps which are taking more space and are unwanted. Integrating it with the memory booster helps you to schedule the killing of applications. This can be used by android mobiles like Samsung Galaxy S3, LG G Flex and is highly recommended for every android smartphone. Juice Defender Android app reduces the draining of battery by controlling 3G/4G data connections along with various components of the device. You need to create 3 profiles in order to save the battery life of your Android device. Each profile plays it part. The balanced profile is fully automated and it does not require any input from you. Aggressive profile disables the data connection when your mobile is running on the low battery and can be turned on through notifications area. Disabling the data connection on low battery helps you to use your mobile for few more hours. Extreme profile disables the Wi-Fi and data connection by default and will not turn ON until you activate it manually. If you are not in your Wi-Fi network region or if there is no network available, then this would turn off your data connection and Wi-Fi. This is most needed for high-end android mobiles like Sony Xperia Z2, Motorola Moto X, and LG Optimus G. It does not mean it is restricted to other mobiles. Any android mobile can make the best use of it. This app is somewhat similar to Android Assistant in providing the quick boost button and allowing you to kill unwanted apps. But, this has an additional feature of adding user and system apps to the white list. This white list plays an important role when you are performing the action of killing apps. It does not allow you to kill the apps from the white list. So, apps in your white list cannot be killed even accidentally. This app has the great features to improve the battery life. This provides you the way to schedule killing of apps from day to day or per week basis. You can also set the rule to kills apps when your mobile is running out of memory. Memory Booster also allows you to kill apps whenever you lock your mobile. This also provides the permissions to edit the processes or apps that have been running on the startup. You can remove unwanted apps in the start up itself. This improves the battery life of an android device by speeding up the transfer rate from and to SD Card. Whatever we transfer and the time it takes to get transferred, shows the impact on the battery life. So, SD Speed Increase Android app mainly concentrates on that. It allows you to make some settings to the size of the Cache. You can increase the size of the Cache on SD Card and can be set to default, by just restarting the mobile. This may not be preferred by all android mobile but can be used for Motorola Moto E, Nexus 5 and Panasonic T21. Battery Save Booster does the job of saving the battery life of an Android device with just a single click. As we discussed keeping the Wi-Fi and data connection ON for a long time and that too in a network unavailable places brings down the battery. When you have those two things ON every time, it searches for the available network forcibly. Thus, it reduces most of your mobile’s battery. So, Battery Save Booster app manages the data connection in an efficient way. Along with this, background process also causes the problem to the battery. These background processes are also managed by this android app. This app plays a key role in extending the battery life of an android mobile. Power saving mode in a mobile saves a lot of battery. This app helps you to set to run your mobile in the power saving mode if you are not using it for a long time. For example, if you are having a meeting with your boss or you are having a lunch, then this would allow making your device to run in the power saving mode for such time. It shows you the list of apps which are taking more power and can be disabled with just a tap. COMODO Battery Saver gives you an alert when the battery is low and also when it is completely charged. This extends the battery life of a mobile based on how you use the mobile. Yes, you heard it right. It learns automatically on how you use your mobile and it adjusts the settings based on that. This notifies the user regarding the power taken by the app is low or high. If you are using an app which kills your battery life, then it notifies as a message regarding the problem. Then it will be your decision to proceed further. This does the job of increasing the battery life in an efficient way. Deep Sleep Battery Saver android app keeps your phone in the deep sleep mode, which turns OFF your data connection and Wi-Fi. It also stops running the background processes. Mobile gets back to normal state for every regular interval and does the job of emails downloading and updating the required apps. This allows making the mobile work and using the battery only when required. So, these are some of the tips and best android apps to increase the battery life of every android mobile. Most of them are free and need to get the paid version to use all of its features reluctantly. Go ahead and start installing these battery saving apps on your android mobiles and make the most use of the battery. Boot Windows O/S in Safe Mode – F8 Not Working? How To Play PS2 Games On PC Without Emulator?